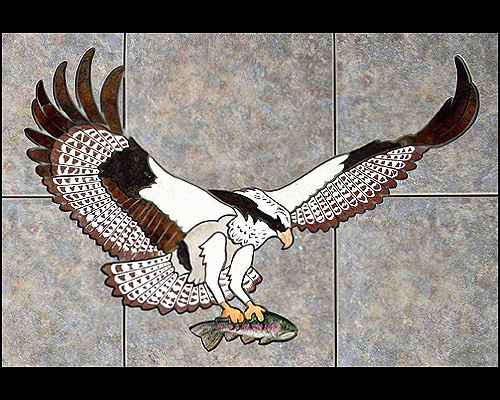 Photo gallery of mosaic inlays done for a variety of projects by Jim and Holly Cutting. Many of the images below are miscellaneous projects and custom orders. We've made stove pads (fire codes have changed - ask us about installation possibilities), custom made mosaic mirrors, and many other specialty items. There are always new and creative projects going on in our shop. We'd like to hear from you on your thoughts and ideas, lets sketch it out, give you a quote, and then continue with the creative process making that unique piece custom just for you. Check out our other galleries that contain more photos of stone mosaics. Gallery ( 1 ) has walls while gallery ( 2 ) has floor photos.